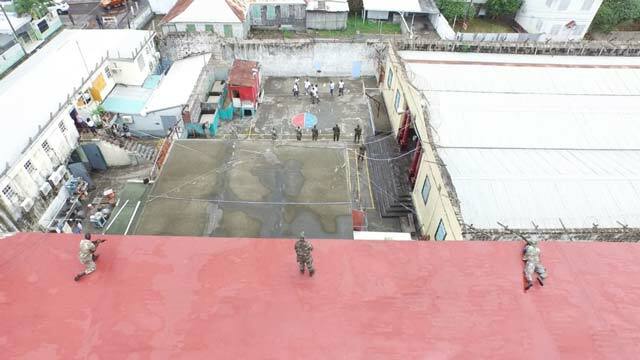 Basseterre, St. Kitts – An altercation at Her Majesty’s Prison between two rival gangs over the weekend has left an inmate nursing stab wounds and caused the facility to close its doors on visitors for the time being. According to sources, the incident took place on Saturday with two rival gangs said to have originated from the Basseterre area. The Observer understands that a prisoner was stabbed on Monday in relation to that incident and had to undergo surgery at the J N F Hospital. It is unknown whether or not any of the members were injured in the Saturday morning incident. The injured prisoner is believed to be a person charged in a robbery incident in St. Kitts. The wounded person was said to have been transported to the hospital using a vehicle owned by Her Majety’s Prison. Unconfirmed reports also state that the prison facility also suffered some minor damages from at least one of those fighting incidents. This publication contacted Superintendent of Prisons Juni Hodge, who confirmed the incident, but indicated that he could not provide details into the matter as it is currently under investigation. Hodge also confirmed that while the incident is under investigation the prison will be closed to visitations until the investigations were complete. Visitations were suspended earlier this year at the facility in order for the installation of a full-body scanner.